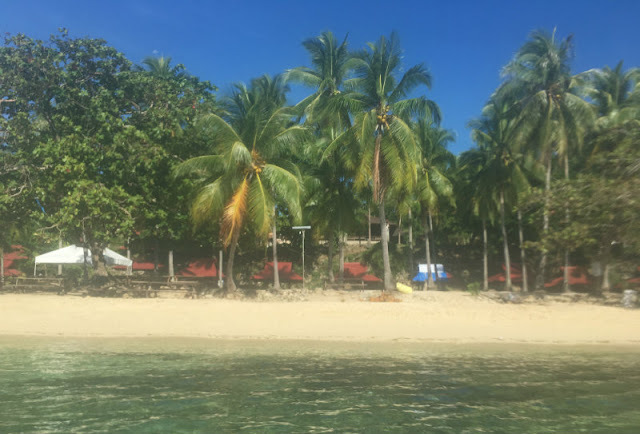 Dalaguete Beach Park is a beautiful white sand beach comparable to Tingko Beach in Alcoy, Basdaku Beach in Moalboal and other beaches in Cebu Province. 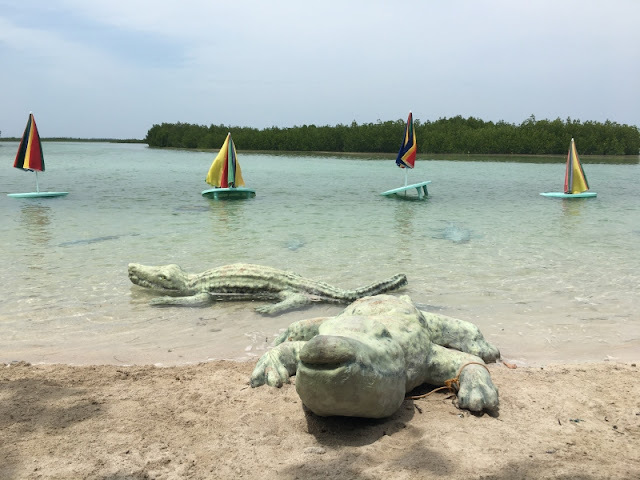 The beach park is owned and operated by the Municipality of Dalaguete. 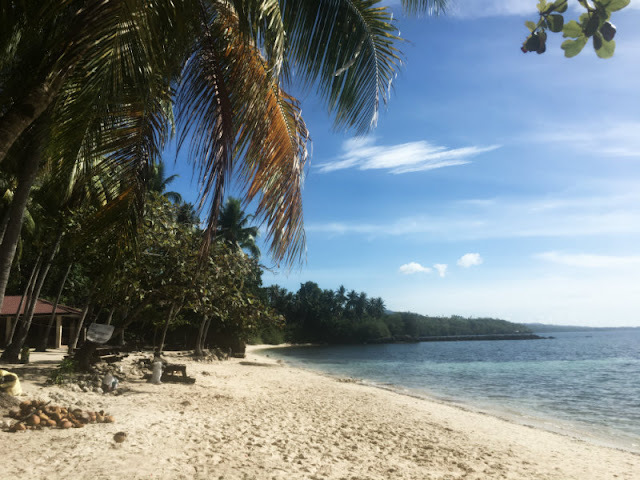 Locals call the place as Casay Beach as the beach is located in Barangay Casay, Dalaguete, Cebu. 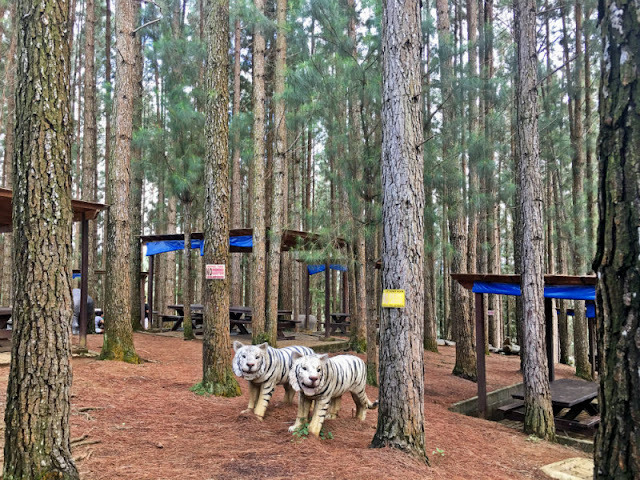 The place is 1.5km away from the national road. Dalaguete Beach Park Casay Beach Signage and Phone Number - if you are coming from Cebu City or Argao, the signage is on your left. If you are coming from the town of Dalaguete, the signage is on your right after passing by Casay Barangay Hall. Entrance to Casay Beach or Dalaguete Beach Park is only P30 and per research, kids are charged P15. You can bring food there and if you don't want to bring any, you can buy at the stores within the premises. The habal habal driver who brought us there told us the tables are for free but there are cottages that are for rent ranging from P200-P350 or even more. You may contact the number listed on their signage for clarification at (032) 253-3532. 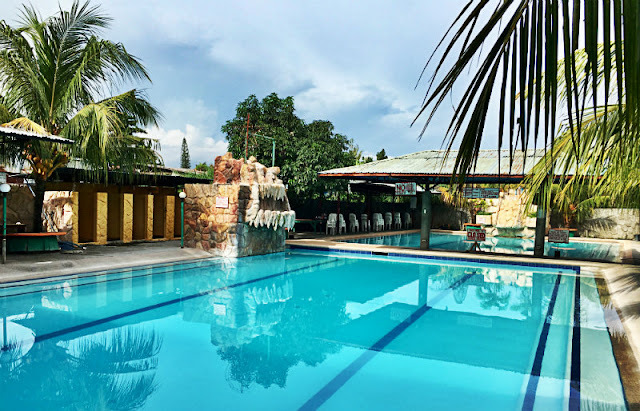 Shower fee is P20 for adults and P10 for children. 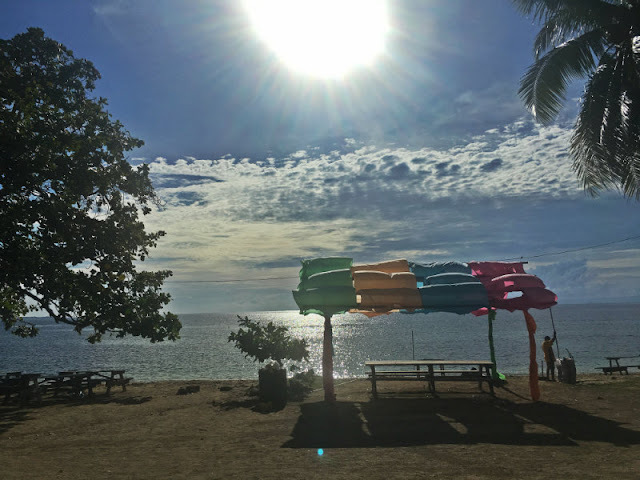 Per research Dalaguete Beach Park is open from 7:00am to 5:00pm. 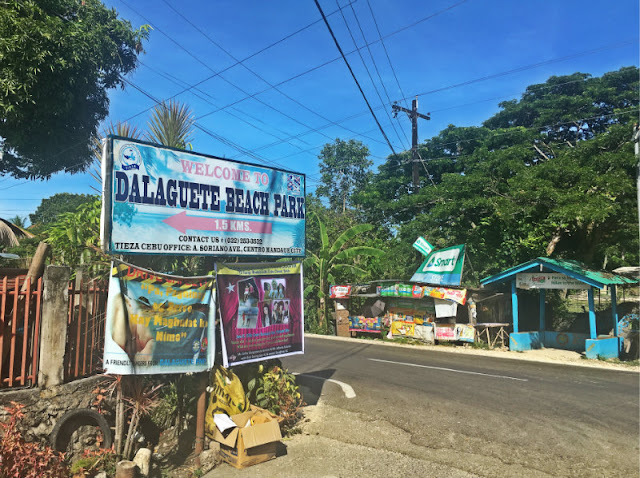 Dalaguete Beach Park - Convenience Stores, Shower Rooms, Tables, Cottages. 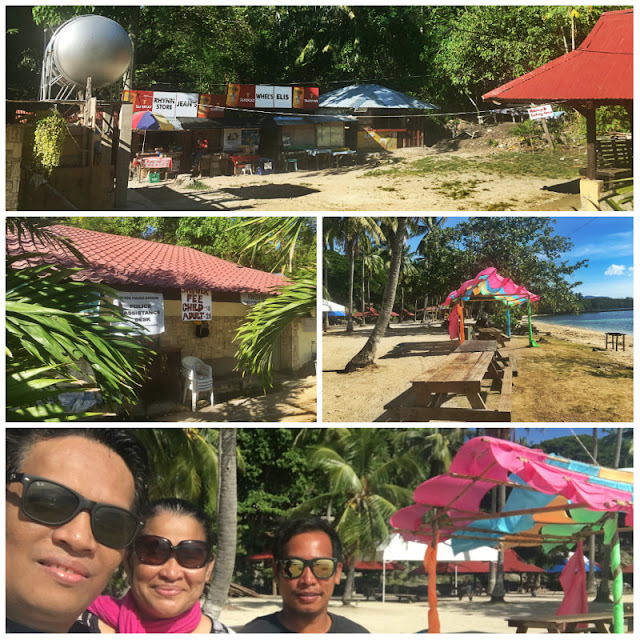 Thanks to our guide who patiently waited for us while we dipped at the beautiful beach in Casay, Dalaguete. If you want to go there solo and just want to stay there for about an hour or two, you may just put your things on the table or on the beach front. 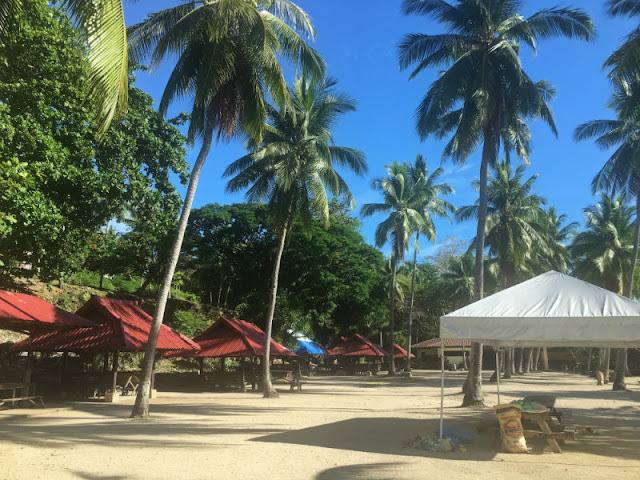 There is no place to stay overnight there, so if you want to go there, best time to go is on weekdays as the place as beautiful as Casay Beach can get so crowded on weekends and holidays. If you are from other provinces or countries, you may stay in Dalaguete at Ocean Bay Beach Resort, Dakong Bato Beach, Rockwalled, etc. 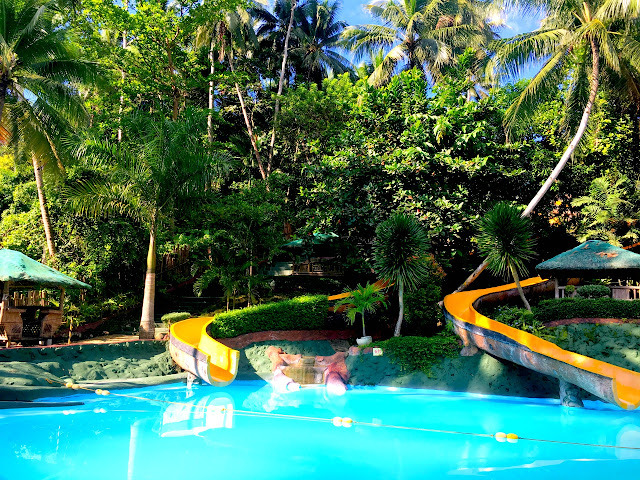 You can also stay in the nearby town of Argao at Bamboo Paradise, Argao Royal Palms Serviced Villas, Panorama de Argao, Woodruffs Beach Resort, Looc Garden Beach Resort, Argao Heli Suites, Argao Vacation House, Kingfisher Beach Resort, Baluarte de Argao Beach Club, etc. You may book online thru their websites or thru agoda.com, booking.com, trivago.com, airbnb.com, etc. There is a parking area inside and a corresponding parking fee is collected. Per research, the fee is P20. Go to Cebu South Bus Terminal. If you are far from the terminal, ride a taxi, Grab or Uber. From the terminal ride a bus bound for Dalaguete or Alcoy or Bato via Oslob/Liloan or Bato via Sibonga depending on which bus you want to ride in. Fare is P130 or lesser. Travel time is a little over 2 hours. Disembark at the corner heading to Dalaguete Beach Park in Casay, Dalaguete, Cebu. Tell the bus steward to drop you off at a corner heading to Casay Beach/Dalaguete Beach Park. Hire a tricycle or habal habal (motorbike) to bring you to the beach park. Fare as my research shows is P10. The place is 1.5km away from the national road. If you want to go there using your private vehicle, from Carcar City Rotunda, use the Sibonga bound route then after the town of Argao and before reaching Dalaguete town proper, you will see the signage on your left that leads you to Dalaguete Beach Park, use that road and after 1.5km, you will reach the beach park. This is how we went there. Fare from Cebu South Bus Terminal to Dalaguete is P130 (aircon). Ride a tricycle to Dalaguete Town Proper, the one where there is 7Eleven. Fare depends on your point of origin. We stayed in Ocean Bay and fare was P8. There are habal habal drivers standing by at the crossing near 7Eleven. 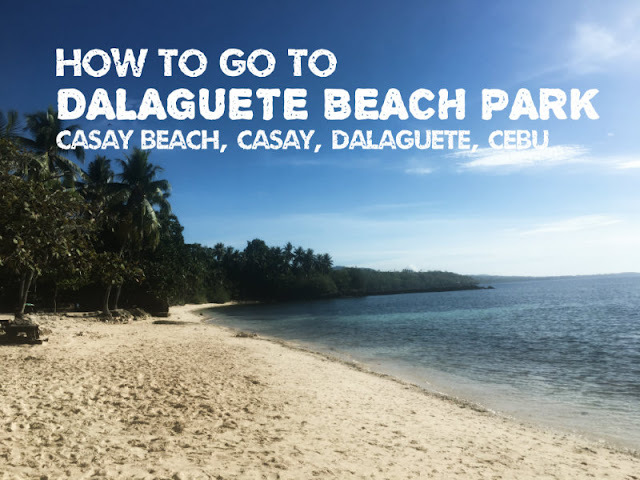 At Dalaguete Town proper, tell the driver you want to go to Dalaguete Beach Park but most of them refer to it as Casay Beach. Fare is P75. Travel time from Dalaguete town to Casay Beach is about 20 to 25 minutes. 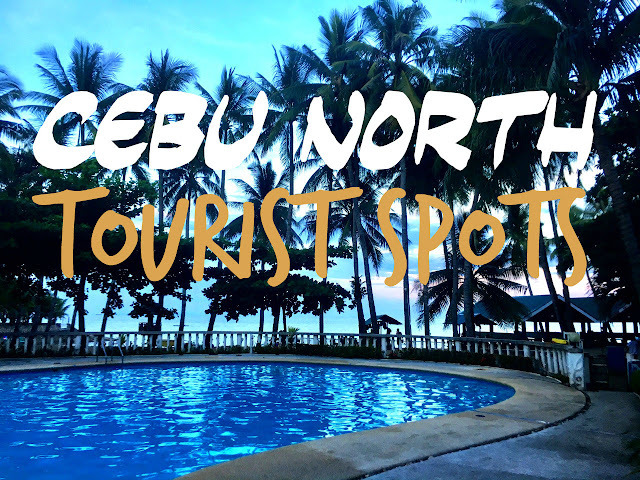 Alternatively, you can go there from Dalaguete town by riding a bus bound for Cebu City on the street then tell the driver to drop you off at Dalaguete Beach Park/Casay Beach. From there, ride a tricycle or motorbike to bring you to the place. You can actually walk if you want but remember the distance, it's 1.5km from the national road. If you're going there from Dalaguete town using your private vehicle, shift your gear and slow down once you reached Casay Barangay Hall, the corner heading to the beach is a few meters away on your right, use that road where you see the signage Dalaguete Beach Park. If you are from other provinces or town and intend to stay in Argao, see direction below on how to go to Casay Beach. Fare from Cebu South Bus Terminal to Argao is P100 (aircon). 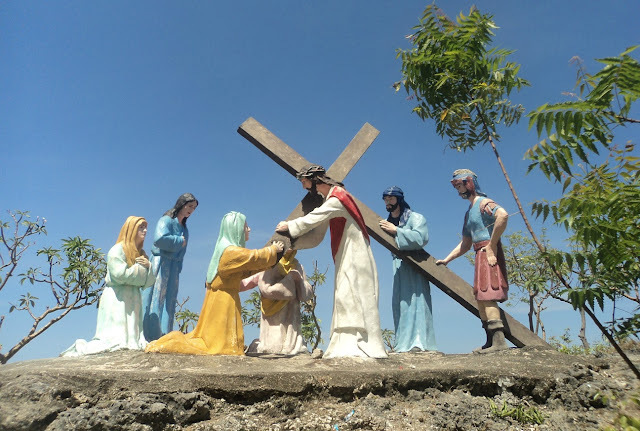 Go to Argao Church/Plaza or Town Proper. Ride a tricycle and tell the driver you want to go to Dalaguete Beach Park but most of them refer to it as Casay Beach. 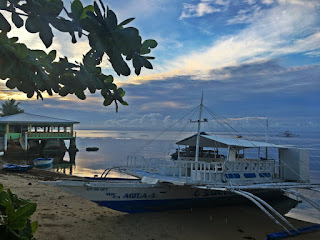 Travel time from Argao town to Casay Beach maybe about 45 minutes to 1 hour. 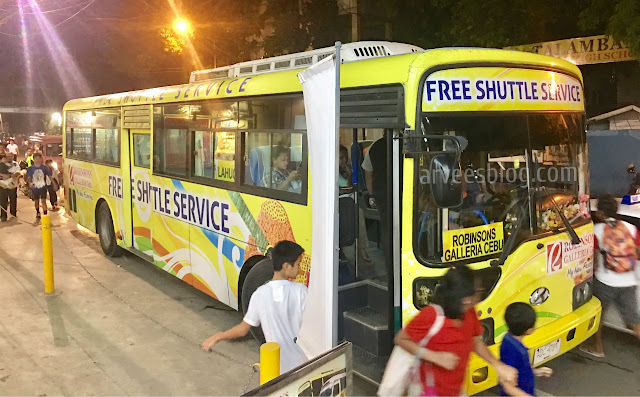 Fare could be higher than P75. 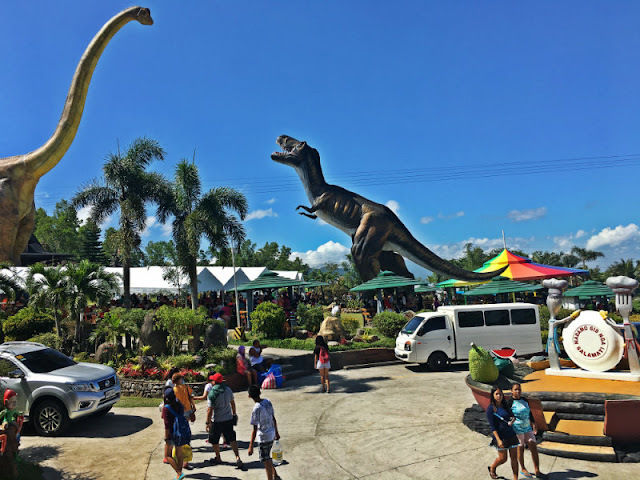 Alternatively, you can go there from Argao town by riding a bus bound for Dalaguete or Alcoy or Oslob or Santander on the street then tell the driver to drop you off at Dalaguete Beach Park/Casay Beach. From there, ride a tricycle to bring you to the place. You can actually walk if you want but remember the distance, it's 1.5km from the national road. Hi Kylenventurous, thanks for dropping by. I think no, per research, their operating hours is from 7:00am to 5:00pm. You may contact the number listed on their signage for clarification at (032) 253-3532. Hope this helps.